Earlier this year, the US Commerce Department imposed a 30% anti-dumping duty on newsprint imported from Canada. The measure was taken in response to a complaint filed by North Pacific Paper Company (NORPAC), one of five newsprint paper mills in the US, that sellers of Canadian uncoated groundwood had an unfair advantage over domestic sources. These objections have been subsequently backed up by newspaper publishers across the country. From the large national dailies to smaller regional and local papers, publishing executives have warned that the sudden increase in newsprint costs is leading to page count and staff cuts and, in some cases, the ceasing of publication. A coalition of printers, publishers, paper suppliers and distributors has been formed to lobby Congress to put an end to the tariffs. More than 70 organizations and companies have have joined Stop the Tariffs on Printers and Publishers (STOPP) to collect signatures on a petition and send messages to local Senators and Representatives aimed at overturning the Commerce Department’s decisions. 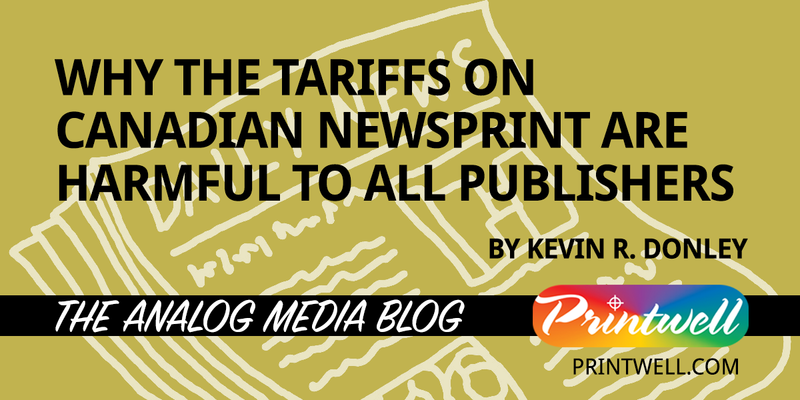 As many printing industry experts and advisers have pointed out, the newsprint tariffs are coming at a time of volatility in the global printing paper markets. Since the summer of 2017, the cost of all grades of commercial and publication printing paper have been rising steadily. As I have written previously in this blog, the reasons for rising paper prices are multiple and complex. The combined impact of declining demand for all paper, the shuttering of paper mill capacity along with a rapid increase in demand for wood fiber and pulp associated with consumer product packaging and e-commerce sales has driven up printing paper costs by as much as 20% since last August. In other words, even printing and publishing customers who are not buying newsprint are being hit by the tariffs. The rise in newsprint costs is serving to bolster the paper price increases in the rest of the market and will further push these prices up across the board in the future. At Prinwell, we are committed to keeping our customers informed on the subjects that are affecting their businesses. We want to help you navigate the challenging environment we are all facing and have ideas about how you can manage increasing costs. Please contact your Printwell account executive for a consultation or submit a request through our website here and a member of our sales team will get in touch with you.